The sharks are closing in the scuba diver...quick get your camera ready! How did you come up with costume idea? When my husband, Jesse, and I asked our two year old daughter, Nora, what she wanted to be for Halloween some of the responses we got were Tuesday, ice cream and bathing suit. Living in New Jersey, Halloween night can get very cold and already owning a wet suit we figured that would be a good starting point. We knew we wanted to incorporate a wagon as we knew any parade or lengthy trick or treat would be too much on a two year olds little legs. We tossed around a few different ocean themed ideas that involved a wetsuit for Nora. Once we settled on scuba diver, shark and ocean wagon, we knew we had to get to building a dive tank. We did not want a gruesome shark attack on a surfer or anything as our vision of Halloween is fun for the whole family. Living just 4 miles from the Atlantic ocean, we did not want our children fearful of the animals we share the water with. This is especially important as their daddy is a surfer! We hit Lowes in late September and began construction! Scuba diver: We used an O'Neil toddler size 1 wetsuit which Nora already owned as the base of the costume. For accessories, we purchased a snorkel set at Target on end if season clearance and used the mask. We placed this on the top of her head to prevent fogging while navigating parades and trick or treating. Her dive tanks were constructed from two 1-liter seltzer bottles, emptied and filled with paint to match her costume. We used black electric tape for the tank details and to have them stick together. My husband used parts of our hose and sprinkler system to design the regulator components. Lastly, Nora had a pacifier as her oxygen mouth piece. Once the tanks were finalized, we wove a landyard through it to make backpack style straps for her to wear over her shoulders and on her back. We secured four pool noodles with velcro to a running race belt (which would typically be worn in a road race with a bib number) to serve as the weights a diver would wear. Lastly, we created felt flippers and added an elastic band to secure them around the base of her foot, covering the top of her shoes. Wagon: We purchased half inch PVC piping, T shapes and elbows from Lowes to create the cage. Once the design was finalized, we painted it a slate shimmer gray to make it appear as if it were a metal cage. We added two jellyfish and one shark stuffed animal using TY Beanie Babies. To decoy the wagon, we purchased blue water patterned felt, two different green jersey cotton materials and a sea turtle material. We measured the wagon and cut the water to match. Once we had our “ocean” cut, we added seaweed and a school of sea turtles. Finally, to add a 3D effect, we added a few more sea animals such as crabs, fish and seahorse. Baby shark: Our baby shark was only 2.5 months old when we had to attend our first Trunk or Treat. We knew we wanted to incorporate baby wearing for his costume as holding a 15lb baby in a costume is not fun for anyone. I was able to find a 6-12m “vest” style costume at Target 40% off with the Cartwheel app. We decided to cut the over the head costume in half and resew the seams shut. This made it look more like a jacket now than an over the head costume that is too big and puffy for an infant to comfortably wear. 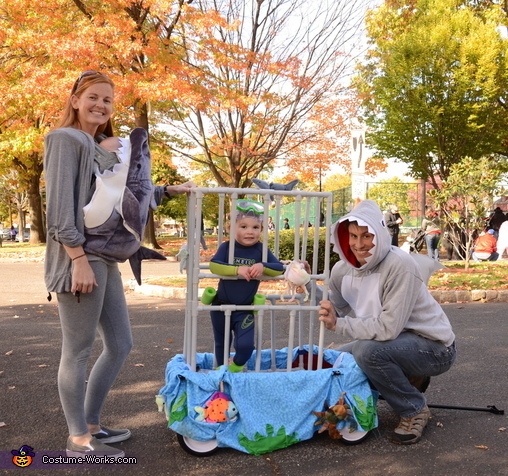 When it was time to participate in a parade or trick or treat, I would place Kellen in our Ergo Baby infant carrier and secure the shark to the outside. We pulled the shark hood up to cover him from any sun or wind. He slept through every event we attended this Halloween season! Shark sweatshirt: Materials needed: gray hooded sweatshirt, 2 red felt, 4 white felt (2 regular and 2 sticky), 2 gray felt, batting, hot glue gun and glue. Instructions: Draw pointed teeth on regular white felt and cut out. Hot glue the white teeth along the rim of the hood so they frame the face. You want the felt on the inside of the sweatshirt. Flip the sweatshirt inside out and trace the shape of the hood onto red felt. We cut the exact shape of the hood out. Glue over the white teeth and throughout the hood. This creates the gum line and the big red mouth! Place two pieces of gray felt on top of one another and draw a dorsal fin. Cut them out and glue together, leaving one side open to stuff with batting. Once the fin is constructed and the hood is dry, you may flip the sweat back to the proper orientation. Prior to gluing the dorsal fin on the sweatshirt, trim the squared edges of the sticky white felt, rounding them off. You want to place one sheet on top of the second over lapping about ¼” to create a large white rectangle. Peel back the sticky paper and place the felt rectangle on the sweatshirt’s front creating a white “torso” or under layer of the shark. Secure the outside edges of the white felt with hot glue. Once the hood and torso are dry, have the person who will be wearing the sweatshirt put it on. Mark with a pencil a good height for the dorsal fin to be placed. Remove sweatshirt. Hot glue the dorsal to the center of the back at the chosen height. 1. "Wow, I've never seen that before." 2. "Can I take a picture? I've got to show my friends." 3. "That's so creative! Where did you get the idea?" 4. "Wait, is that a real wetsuit?" 5. "Haha, look at the baby shark! Oh wait, there is a real baby in there! So cool. How old?" 7. "What a great use for beanie babies. Who knew we'd see a use for them in 2015!" 8. "Oh wow, look at her tanks! I'm a diver and they are so realistic!" 9. "She's even got a water proof camera in the cage. What great attention to detail." 10. "I love how the whole family got into it." We knew we had several different plans for Halloween as we like to get a lot of use out of costumes. Being that we were going to be travelling we made the costume be able to break down very easily. The cage was PVC piping so we just popped it together and apart to travel to different events and locations without taking up a ton of room. Additionally, we used Velcro to secure the fabric to the wagon so we could essentially secure and decoy any wagon. We drove 1.5 hours from our house to my in-laws to attend a township Halloween parade with them well. We just popped the whole ocean off our wagon, threw it in a tote bag and drove. Once we arrived at the parade, we wrapped the fabric around their wagon and off we went. We were able to bring everything else we needed for two adults and 2 kids for a weekend away without having to lug the wagon as well.